We introduce you the redrawn famous Fruit Cocktail slot machine. Slot has five spinning reels, 9 playing lines, gambling game and bonus game that can theoretically go on forever, with an average duration of 4 spins. Standard payout table for combinations per lines is shown at the bottom. 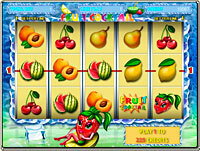 Fruit Cocktail slot machine is developed in 2012. Built-in fair play control system guarantees constant slot rate of return. All five reels are similar and have 50 symbols. This section provides a layout of 50 reel symbols. Slot machine fair play control system applies to play per lines, gambling game and bonus game. For details, see FAIR PLAY CONTROL section. Fair play control for bonus game of Fruit Cocktail slot machine has its own features, which can be found below. Brief rules and payout table is always available when pressing HELP button of Fruit Cocktail game window. If any line where you have a bet, has three or more same symbols standing side by side, mandatorily including outer reels, you win according to payout table available when pressing HELP in the game window (page 2, page 3). Cocktail is a wild symbol, it means that it can replace any of the symbols on the reels except Fruit Cocktail symbol. In case where wild symbol on any line makes two combinations, the combination is paid with a greater win coefficient. If you wish, after payment in the main game, you can try to double your win. To do this, press DOUBLE. Four cards face down and one dealer’s card face up is shown to the player. By pressing LINE 3 ... LINE 9, the player has to open one of them. If the selected card has higher rank than the dealer’s card, or is a Joker, win will be doubled and a new level of gambling will be offered to the player. If the player opens the card of the rank lower than the dealer’s, he loses his current win. Equality of cards means draw, and the player goes to the next level of gambling. This slot machine has NINE gambling levels. The player may abandon another attempt to double and take cash after the dealer’s card is shown face up. To abandon gambling, press START. PS: Ace of Spades card is replaced by the Joker. Bonus game appears randomly, like other win combinations. Bonus game requires that three or more strawberry symbols appear on the entire screen (on any of the fifteen visible symbols of all 5 reels). Three appeared strawberries cause one bonus game. Four strawberries – 2 consecutive bonus game. 5 strawberries appeared at the same time cause 3 bonus games. If in addition to strawberry symbols, winning combinations appeared on playing lines, they are paid after the end of bonus game. Bonus game is played in few individual spins on three randomly stopping reels and an additional set of symbols arranged along the perimeter. Before the start of each new spin of bonus game, the player shall press START. Coincidence of the highlighted image on the perimeter with the symbol on the reels triggers win according to the multipliers shown in help pages (page 5). If EXIT symbol appears on the perimeter, bonus game ends, and all credits won are multiplied by total bet and added to total credit of the player after returning to the main game. When playing for cash, autoplay function becomes available activated by an additional button (to the right of START button). In this mode, if there is no win in the main game, the reels make next spin automatically, while maintaining the same bets and number of lines. Ways of reel stopping and gambling game of FRUIT COCKTAIL slot machine are the same as the mechanisms previously detailed in Slot Machine Fair Play Control on the example of Crazy Monkey slot. Fair Play Control in Bonus Game. Similarly as in the main game, five numbers after Spin word determine the position of the reels stop for bonus game. Numbers 4, 25, 17, 12, 8 set the first top symbols of the stopped reels, which are not visible in bonus game. Visible symbols for this spin symbols will be 26, 18, 13 as bonus game uses only the central symbols of the second, third and fourth reels. Bonus=14 tab determines the serial number of the cell along the perimeter. Before each new spin of bonus game, the player can set the offset for the symbol appearing along the perimeter (using the first left set of +/- buttons), and the offset for each reel individually (the second, third and fourth set of +/- buttons).